The arrival of a baby in your life marks the beginning of a new journey for your spouse and you. And as new parents, it is normal to feel the pressure and stress of parenthood initially. Moreover, your wife may feel it more than you do, because she would be spending more time with the baby. 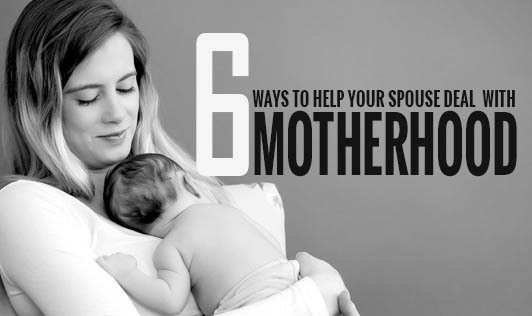 It is important to keep in mind that this is a passing phase and if you follow these simple tips, you can help your wife get through the initial challenges of motherhood with ease. Help her sleep according to the baby’s sleep schedule. New born babies have erratic sleeping hours and new mothers are generally advised to sleep when their baby sleeps, so that they can be up and active when the baby needs them. It is therefore advisable to plan your schedule in such a way that your wife gets to rest when the baby is asleep. Encourage her to eat healthy: Breastfeeding can induce sudden hunger pangs which may make your wife want to reach out for oily junk food. Make sure, your wife stays away from unhealthy eating. A healthy diet benefits the mother and the baby. Try broken wheat, milk, soya, soup, honey, and almonds and other easily digestible food options. Cut down on your night outs: Your wife is more likely to feel exhausted from spending the entire day with the baby. During such times, it is your responsibility to take charge. Spend time with the baby and take care of your spouse instead of doing late night outs with friends. Try giving up bad habits: Smoking or any sort of substance abuse is a big threat to a healthy home environment. Follow healthy lifestyle habits to stay healthy for your new role as father. Never panic: A happy and peaceful mind is more prepared to handle emergency situations. So, always have a positive approach and avoid playing the blame game if there has been a mistake. There is certainly no rule book available to master the concept of parenthood. Take each moment at a time and react accordingly so that you both of you can enjoy the journey to the fullest.